Syfy announced today that it has renewed its critically-acclaimed series The Expanse for a second season. The 13-episode The Expanse Season 2 from Alcon Television Group is expected to air in early 2017. “‘The Expanse’ is firing on all cylinders creatively, building a passionate fan base among viewers and critics alike, and delivering on Syfy’s promise of smart, provocative science fiction entertainment. We can’t wait to see where the story takes us in season two,” said Dave Howe, President, Syfy and Chiller. 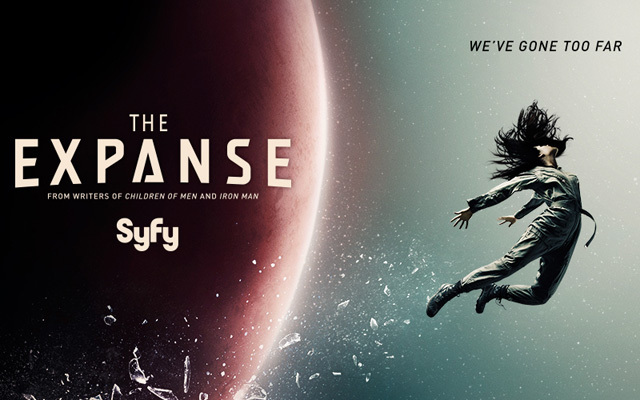 Currently airing on Syfy Tuesdays at 10PM ET/PT, The Expanse has garnered strong multiplatform viewership since its December 14 debut, with 4.5 million viewers sampling the first episode on Syfy.com, On Demand and digital outlets prior to the series’ linear premiere, and an average of 1.6 million P2+ linear viewers (L3) in its first three episodes. Set 200 years in the future, The Expanse follows the case of a missing young woman that brings a hardened detective (Thomas Jane) and a rogue ship’s captain (Steven Strait) together in a race across the solar system that will expose the greatest conspiracy in human history. In the episode premiering next Tuesday, January 5 at 10PM ET/PT — the fifth in the 10-part first season – Holden (Strait) and his crew make a deal with an unlikely ally (Chad Coleman). Meanwhile Detective Miller’s (Jane) obsession over the missing Julie Mao (Florence Faivre) continues to grow. Shohreh Aghdashloo also stars as Chrisjen Avasarala, along with Dominique Tipper, Cas Anvar and Wes Chatham. Academy Award-nominated screenwriting duo Mark Fergus and Hawk Ostby (Children of Men, Iron Man) serve as writers, as well as executive producers and showrunners. Executive producer Naren Shankar (“CSI,” “Farscape”) is also showrunner. The Expanse is financed and produced by Alcon Television Group (ATG), a division of Alcon Entertainment. Alcon co-founders and co-CEOs Andrew Kosove and Broderick Johnson serve as executive producers along with former president of Alcon Television Sharon Hall. Alcon Television executive Ben Roberts serves as co-producer. Sean Daniel and Jason Brown of the Sean Daniel Company are executive producers. Ben Cook serves as a producer. The series is based on the New York Times bestselling book series collectively known as The Expanse, written by Daniel Abraham and Ty Franck (under the pen name James S. A. Corey).